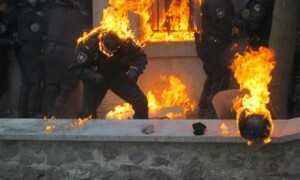 Unrest in the Ukraine – Insights with Zezorro, 1.25.14 | Inside the Eye - Live! Political essayist from Poland, Zezorro, joined for the second time of 2014 for a one hour conversation regarding the ongoing riots in the Ukraine during the week of January 17 – 25, 2014. Social media as a science, tugs of war between Europe and Russia, the historical significance of the Ukraine to Russia were but a few of the insights covered in this fascinating interview. One of the “faces” of the “opposition” is Ukrainian boxing champion Vitaly Klitschko, who is said to be backed by the current assistant Secretary of State and former US Ambassador to NATO, Victoria Nuland. Nuland is associated with mainstream Jewish political interests vis-a-vis her being a Neocon and is married to the Neocon hawk Robert Kagan. Other insights raised during the interview includes the use of the American NGO called “Canvas”, a company that was previously involved in the overthrow of Slobodan Milosevic and whose pamphlets have been found in Tahrir Square, Egypt and now the Ukraine. The unrest in the Ukraine may summed up rather simply: a tug of war between Europe and Russia. 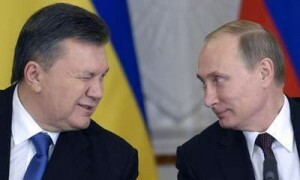 As Zezorro explained, there is a long history of elite relations between the Ukraine and Russia, with Russia being historically rooted in the cultural influence of the Ukraine. In addition, with some 14.8% of Ukrainians listing Russian as their native language, there remains strong cultural links between areas of the Ukraine and Russia proper. In addition, a Ukraine fully in the block of the European Union would greatly reduce the geo-strategic position of Russia. When all permutations are factored in, Western instigators for regime change (a key demand of the opposition) and a tilt towards the European Union would greatly weaken Russia. Equally, a Ukraine fully in the hands of the European Union opens a fresh market for Jewish banking plunder, a result that would create an increasingly impoverished neighbor on Russia’s southern flank. When it is all said and done, a Ukraine fully or largely in the block of the European Union would create a geo-politically untenable position for Russian strategists. Consequently, we should witness a very sophisticated game by Yanukovich and the Russians in their attempt to turn the tide against the Western backed opposition. 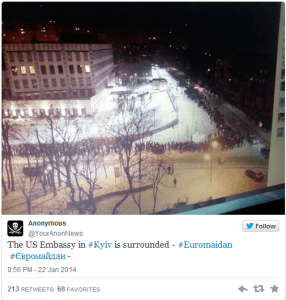 A sense of Ukrainian awareness of US intervention strategies came with the surrounding of the US Embassy on Jan 25, 2014. The protestors were demanding that the United States leave the Ukraine and stop meddling in the internal affairs of the Ukraine. What was being stated was that the Ukraine needs peace and stability, and not chaos. 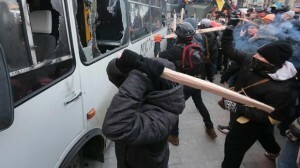 By all measures, the opposition protestors, a mix of genuine Ukrainian patriots and hired goons and provocateurs, will only bring chaos and destruction to the larger body known as “the Ukraine”. A very fascinating and informative interview from one of Poland’s leading bloggers/political essayists.